Danny Fisher just announced that he’ll be maintaining a new Patheos blog, which was mention enough to spark my smoldering curiosity and get me to check out the Patheos Buddhism Portal. So I visited and saw a landing page covered with the work of White people. 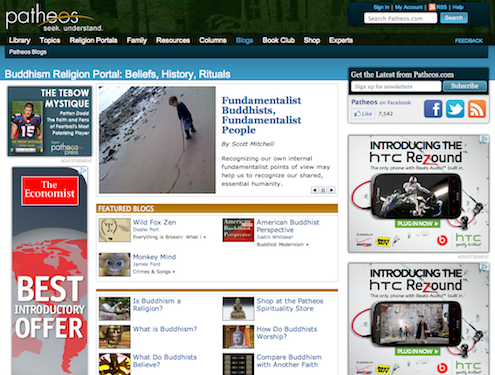 I really worked hard to find the Buddhist Asian folk, but Patheos seems to have created an almost perfect showcase for the stereotype online Buddhist: the White Buddhist American man. Well okay, I managed to sniff out some diversity in that collection of essays on the “Future of Buddhism” in the United States. Among those 22 essays, you can find four written by Asian authors—namely Mushim Ikeda-Nash, Venerable Sheng Yen, Chade-Meng Tan and George Tanabe. With about 18% of those essays by Asians, this Patheos collection ranks at about the same level of Asianness as the general Western Buddhist publication—perhaps a noteworthy trend? Yes I know that Justin Whitaker has publicly vowed to make the effort to try to be “more representative of American/Western Buddhism.” He even followed through by posting about an African American Buddhist! I can’t wait till he writes about another Person of Color! So at least you know that the Patheos Buddhism Portal isn’t the exclusive preserve of White Buddhists. The Portal is not all White—it’s just overwhelmingly dominated by White American Buddhists. And that’s a problem. Uh huh, so what did you expect? The language is all English, and so that is a significant barrier to opportunity for non english speakers,right? Unless we are communicating in Sanskrit or Pali (and who does?) then we have this problem. The real language of yoga / buddhism is only understood by experts, and then only from an academic POV so its prettynlame. OTOH Anti-racist Buddhism is not Buddhism either, it is the opposite of Buddhism, just like most of what you will read online, I think that's right and of course, it's not he whiteness we should be most concerned about, it's the truthfulness, which a s far as I know does not discriminate. Stay Angry! I love the way you stir things up! Very provocative, Arun... Over at my place I had a response of sorts. Help us solve the problem. Editors [at] patheos [dot] com. Years ago, when Patheos was just getting started, before they had any Buddhist content whatsoever, they contacted me to see if I would be interested in being an editor. I had to turn the job down because it seemed like too big a time commitment, and, frankly, I rather like what I do and am not interested in leaving. My experience then, however, suggested to me that the folks who run the site are generally well-meaning and fairly committed to representing the full range of the American religious experience. It's significant, to me anyway, that they include both an atheist and pagan portal. At the same time, keep in mind that they were started by Christians who are interested in inter-religious dialogue and expanding their own knowledge. This, to me, means that they're lapses of good judgement are a reflection of ignorance rather than malice. Your criticisms of course are, in my not-so-humble opinion, well founded. But, in this specific instance, I think we have a good chance at cracking this particular media outlet and changing the terms of the debate. Commenter "D Charles" up there, I believe, is a bona fide employee of the site. And I'm willing to bet that he (and others there) would be more than willing to publish the views of Asian American Buddhists (Angry or otherwise). In short, whereas cracking the cloistered world of the glossy magazines is often daunting and probably damn near impossible, I think there's a real chance at Patheos. First, let me say I think you have an important and valid point of view regarding diversity. I am wondering, however, if you've done any research about this Buddhist portal. Seems to me it has come together quite recently, judging from the number of blogs that have moved over in the last couple of weeks. Have you inquired into that? How these blogs came to be showcased there, and others not? They ask for feedback. Have you contacted them? There's also a call for bloggers. Maybe you could ask them if any Asian bloggers have responded. Maybe you could contribute something, or encourage any Asian Buddhist bloggers you know to submit to them. Now, you are probably right in your point of view here, but without some more information, no one can be sure about it.